These insider secrets I would actually argue are rather intuitive principles if we truly listen to our bodies and palates, and create meals and snacks to satisfy not only our taste-buds but one of the most basic functions food can fulfill: social bonding. While living in Japan I’ve been eating along these guidelines as much as possible, and one of the greatest benefits I’ve noticed has been improved digestion. With efficient digestion we allow our bodies to utilize nutrients and eliminate waste more effectively. This results in a better energy balance and is a great preventive measure against the onset of disease. Don’t Eat on the Run: A couple times I’ve made the mistake of trying to scarf down an snack while dashing in between work and the train. A few embarrassed stares (on my behalf) from passers-by were enough to help me realize my faux pas. Slow down, sit down, relax and savor your meals and snacks. This will boost your production of stomach acid and lower your cortisol levels (stress hormone involved in chronic inflammation). Share Treats: Remember my post about the 80:20 Rule? Let’s not kid ourselves; we all enjoy (and deserve!) a little treat every now and then. What if I challenged you to never eat one alone though? I think we’ve all selfishly devoured a dessert (or two) all to ourselves, but it’s a rare occurrence in Japan. You’ve seen the (average) size of an Asian waistline right? The secret here is everyone shares treats. Whether bringing baking into work; meeting friends for dessert; or bringing a treat home for family; a dessert shared is one with built in portion control, and the release of endorphins from social bonding. This will help distract from any potential binging. Use Chopsticks: Try timing yourself to eat your favorite meal with western cutlery, and then again with chopsticks. I dare you to eat it faster with chopsticks…go on see if you can! Eating with chopsticks will slow your meal pacing down allowing you to properly digest your food. Add thorough chewing in between bites and you’ve doubled your nutritional score in my books. Incorporate Variety and Eat According to the Season: The price of non local, and un seasonal fruit in Japan is enough to help me stay on track with this principle. Regardless, eating what’s in season is our best bet from an environmental standpoint. One of the main impacts being reduced greenhouse gas emissions from the reduction in long distance transport. 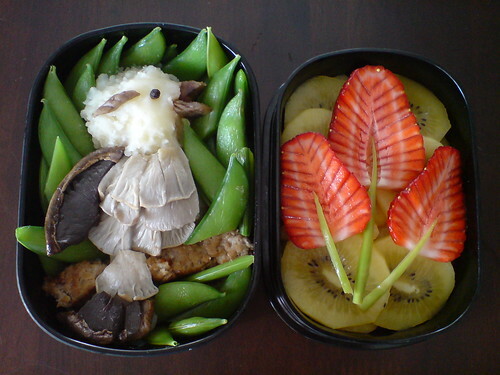 Variety, as found in the traditional Bento Boxes (see discussion below), encourages us to be creative with meal preparation, and allows us to not get bored with our healthfully prepared meals. This keeps us on track when we are already thinking of every excuse to stray off target with our eating habits. 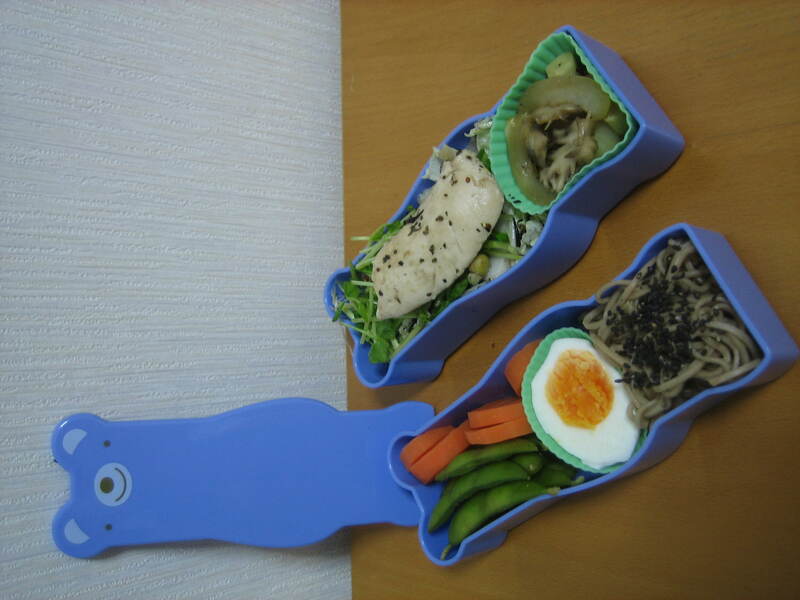 Portion Control: Ala Bento Boxes! 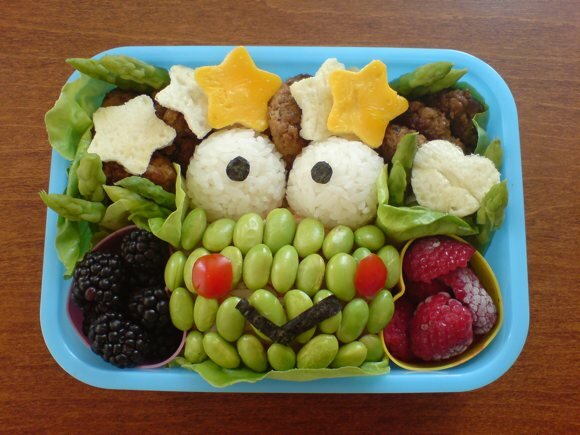 I fell in love with Bento Boxes during my very first lunchtime break at the ESL preschool I’ve been working at. 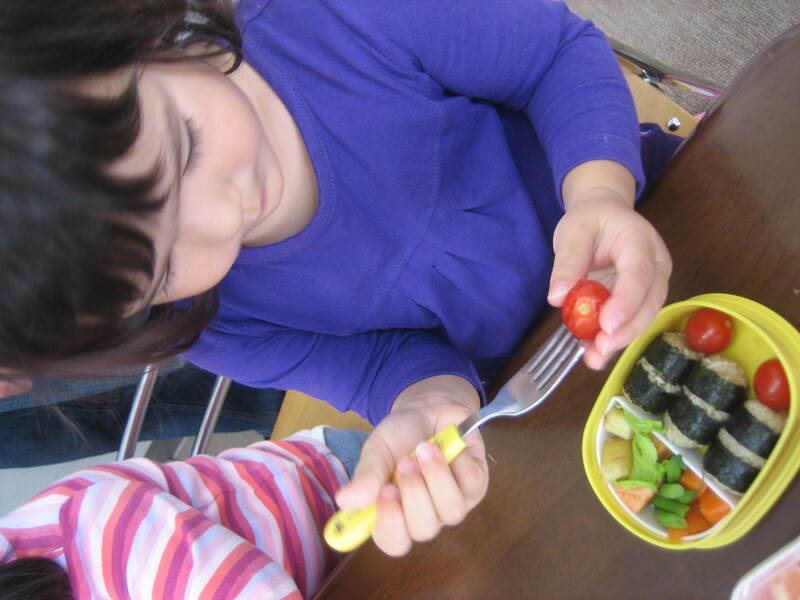 I am amazed at the diversity of ingredients, the creative presentation of a wide variety of foods (including seaweeds, fermented beans, soy, and other menu items most kids would turn their nose at), and ultimately the built in portion control exercised by the compartments and dividers involved in a Bento. "Zoony" (bento box brand) showing off her makers (that's me!) first Bento attempt: steamed veggies; hard boiled egg; soba noodles and black sesame; edamame; cabbage and seaweed salad; sauteed onions and garlic; and grilled chicken. Whew! 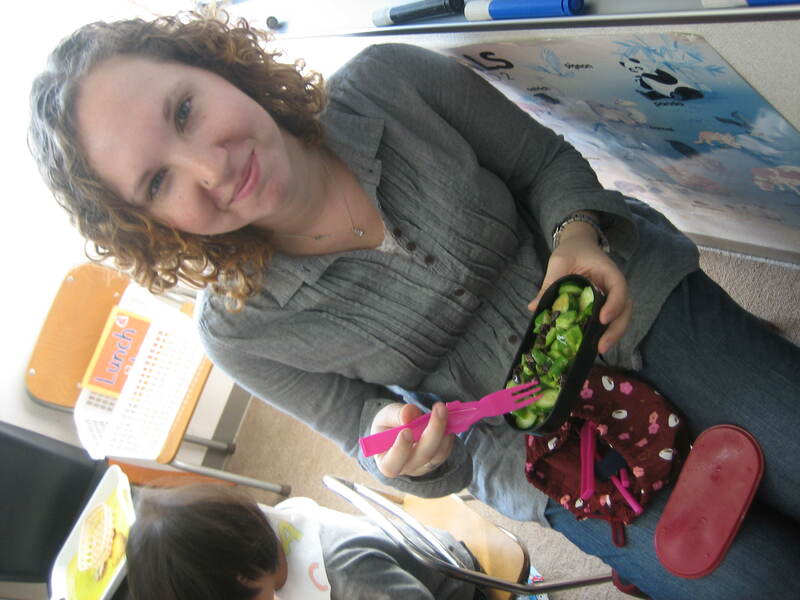 Heather "Sensei" and her veggie based bento. Nice choice! Heart·y (adjective): Nourishing, vigorous, exuberant, genuine, heartfelt, sincere, well. Be lazy for once, let some things come to you...besides, less stress is better for the heart! 2-5 new ideas, tips and recipes are posted each month-don't miss out by signing up to receive them directly to your inbox. Myth Busting: Is Green Tea as Good as We’ve Heard?